During a trip to Nicaragua, journalist Pierre-François Lardet discovered a delicious drink made of banana flour, cocoa, crushed grain, and sugar in a village in the heart of the forest. On his return to Paris, Pierre-François Lardet decided to reproduce this recipe for commercial purposes, and founded the Banania company. In collaboration with a pharmacist friend, he determined the exact proportion of banana flour, cereal grains, cocoa and sugar to mix together for a unique and inimitable taste. He then started looking for a name for his recipe. 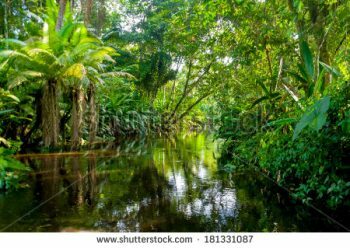 He thought to use “Bananette,” “Bananose,” “Bacao,” “Banacao,” and “Banarica,” but it was BANANIA that he finally chose and registered on August 31, 1914. 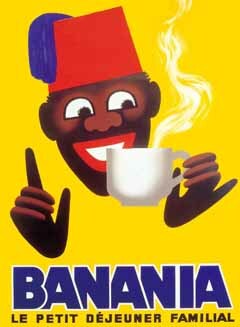 The “Antillean Girl”, drawn by H. Tishon, was the first image of the Banania brand. From the beginning, the nutritional and energy values of this new drink were emphasized: “intensive super-nutrition” “vitality,” “energy,” “health” and “strength” for the whole family. 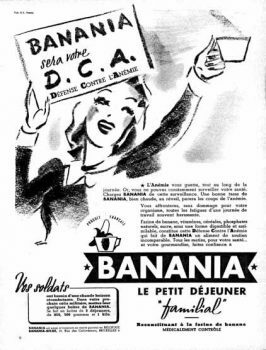 With the outbreak of the 1st World War, Banania became the comfort drink of wartime France. 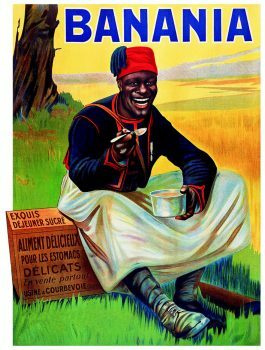 Pierre-François Lardet decided to send fourteen wagons full of his famous chocolate powder to the front, to give “strength and vitality” to the soldiers, including the Senegalese riflemen, who fought so bravely. 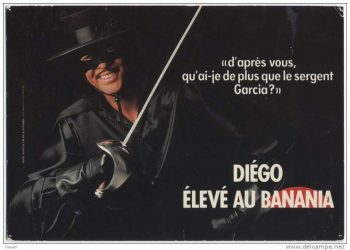 He then asked his friend and former colleague Andreis to draw him one of those Senegalese riflemen to use as the symbol of the BANANIA brand. 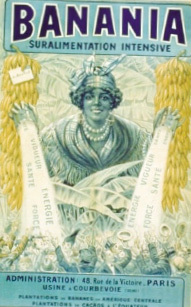 Pierre Lardet joined forces with hotel operator Albert Viallat, who came to replace him as head of the company in 1924. In 1927, Viallat welcomed his nephew Albert Lespinasse into the business. 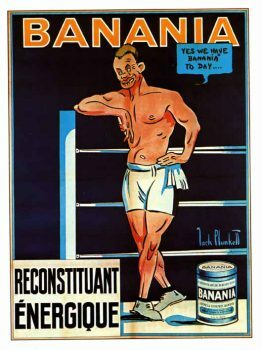 At that time, the Seventh Olympic Games held at Colombes were encouraging the growing popularity of several sports: boxing, hockey, rugby, tennis, all illustrated in Banania promotions. 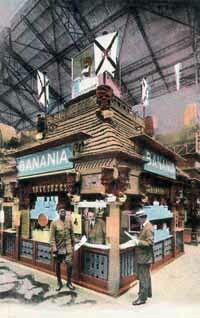 BANANIA took part in the Paris Colonial Exhibition, with huge success. Designer Sepo rejuvenated the figure of the Senegalese rifleman, who now became the brand’s unique and exclusive symbol. 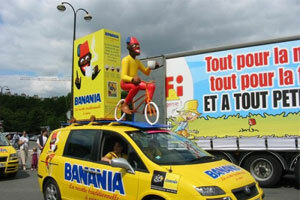 Banania sponsored the Tour de France. This activity started up again from 1984 to 1986. The brand made an outstanding appearance at this event once again in 2003. Albert Lespinasse took over from his uncle as the head of the company. The creation of a new design for advertising posters and packaging was directed by Jacques BAZAINE. The first Banania commercials played the humor card. It was a hit: the brand received the Oscar for Advertising in 1960, and the Advertising Grand Prix in 1965. During the post-war period, many illustrators helped contribute to the evolution of the Banania character. G. de Andreis, G Elizabeth, F. Poulbot, B. Rabier, G. Meunier, Sepo, H. Morvan in 1957, Chaval in 1966, Siné in 1970. Some great artists have served this brand! The rifleman’s smile was replaced by a shining sun. The same year, the brand launched “Tchocolat,” the first high-end chocolate powder intended for adult enjoyment at tea time. At the end of the year, all of the companies within the Midial group (Banania, Benco, Yabon desserts and cereals) were sold to the Corn Products Corporation. The Roux-Séguéla-Cayzac & Goudard agency’s Banania advertising campaign depicted historical figures and movie heroes. 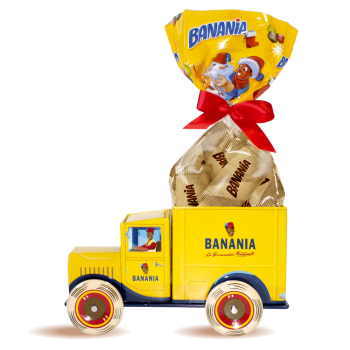 Since 2007, Banania has signed several licensing agreements to develop and commercialize Banania accessories and items, seasonal chocolates (Easter and Christmas), cookies, and flavored milk. 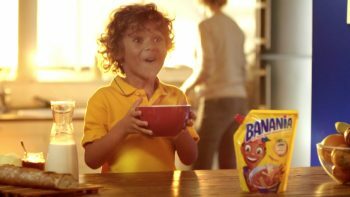 Since 2011, the company has once again been producing television advertising for the BANANIA brand. 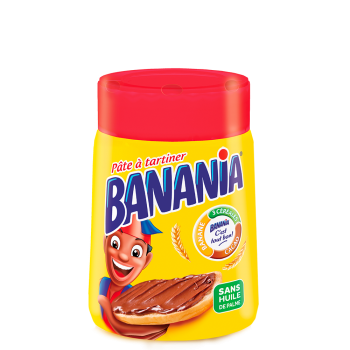 Banania launched its palm-oil free spread product, composed of 25% Banania chocolate powder and natural banana flakes for a crunchy touch! 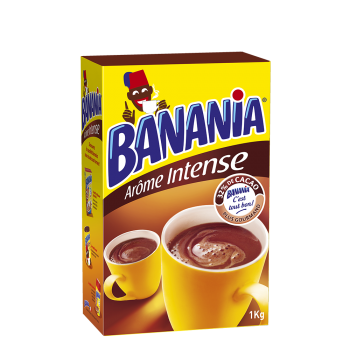 Launch of Banania Intense Flavor, with 32% cocoa, a gourmet product for the whole family. 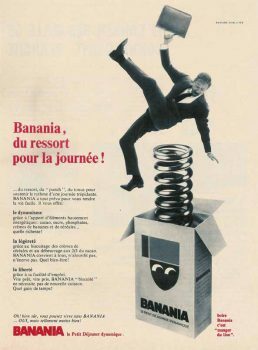 BANANIA is now among the best-known brands in France. Its success falls perfectly in line with its history. Step back into the past: download some of the brand’s old advertisements!